DragonBoost is the PUP that uses misleading techniques to prevent removal. Use Reimage to locate malicious components and get rid of them faster than with uninstall instructions. A full system scan blocks virus reappearance and prevents traffic to malicious domains. Why should you not trust DragonBoost ads? How did I get infected with this adware program? How can I remove DragonBoost from my system? DragonBoost virus perfectly fits the description of a potentially unwanted program (PUP). This ad-supported PUP (by Alto Cloud Media, Ltd.) often sneaks in the PC system if bundled with other free programs that the majority of computer users tend to download from the Internet. Having this adware program on your computer will only cause you problems because it is genuinely developed to make profits for its developers. While DragonBoost ads might seem useful and interesting to some, we are worried about the safety of links that these ads hide. 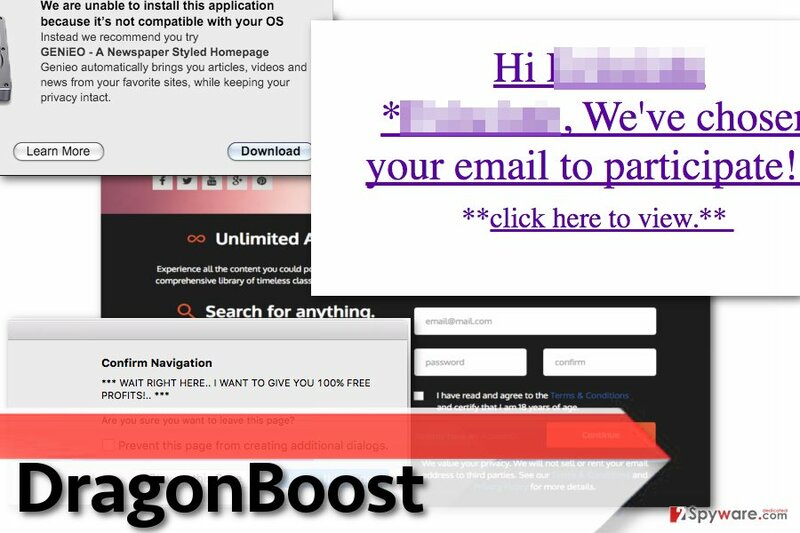 If you click on sponsored content brought to you by DragonBoost adware, there’s a chance to get redirected to suspicious third-party websites that might be trying to convince you to install suspicious software, provide personal details such as your name or email address just to send you email spam. A few examples of annoying DragonBoost ads. You might receive similar ads when infected with DragonBoost adware. Besides, this ad-supported software might be trying to spy on your browsing and search activity and send you targeted ads based on collected data. Please remember that information such as search queries can contain personally identifiable information (depends on what kind of information you search online). If you do not want to be bothered by a spyware type program that wants to push annoying sponsored content to you, better remove DragonBoost from PC. For that, we suggest using programs listed below the article. We highly recommend using Reimage for DragonBoost removal, but if you wish, you can try removing it by yourself using instructions provided below the post. Adware, browser hijackers and similar ad-supported programs are mostly bundled with popular freeware and this way they can sneak into computer systems unnoticed. Software bundling, in general, is a very popular way to convince users install useless free programs without even realizing it. The question is, what makes this software distribution technique so efficient? The problem is that the majority of people do not check information provided in fine print below Standard or Default installation settings. Typically, these settings suggest installing additional third-party applications or browser add-ons that deliver third-party ads. They are presented as beneficial programs that can somehow improve user’s browsing experience or provide some exceptional features, meanwhile, they can do nothing useful. To avoid installing PUPs, choose Custom or Advanced settings for software installation, then deselect suggested programs manually. It is not so hard to remove DragonBoost virus – you only need to know the right way to do it. Of course, the easiest and fastest way to delete this adware program and forget about annoying ads is to run a system scan with a freshly updated anti-spyware software, but you do not must use it. If you wish, you can use DragonBoost removal guide given below and delete this ad-supported computer program by yourself. Search your computer system for programs developed by Alto Cloud Media, Ltd., and remove them. You might find a program called DragonBoost as well – delete it without any hesitations. Here, look for DragonBoost or any other recently installed suspicious programs. Wait until you see Applications folder and look for DragonBoost or any other suspicious programs on it. Now right click on every of such entries and select Move to Trash. Make sure that IE is free of shady add-ons; to check what add-ons were installed on Internet Explorer and delete the ones you do not want to keep, follow these instructions. When in the new window, check Delete personal settings and select Reset again to complete DragonBoost removal. Once these steps are finished, DragonBoost should be removed from your Microsoft Edge browser. Clean your Firefox browser with a help of this tutorial. Here, select DragonBoost and other questionable plugins. Click Remove to delete these entries. Now you will see Reset Firefox to its default state message with Reset Firefox button. Click this button for several times and complete DragonBoost removal. Chrome browser might be contaminated with questionable extensions related to DragonBoost adware. Get rid of them using this guide. Here, select DragonBoost and other malicious plugins and select trash icon to delete these entries. Click Reset to confirm this action and complete DragonBoost removal. Here, select Extensions and look for DragonBoost or other suspicious entries. Click on the Uninstall button to get rid each of them. Now you will see a detailed dialog window filled with reset options. All of those options are usually checked, but you can specify which of them you want to reset. Click the Reset button to complete DragonBoost removal process. ^ How to Tell If A Website Is Dangerous. Gizmo's Freeware. 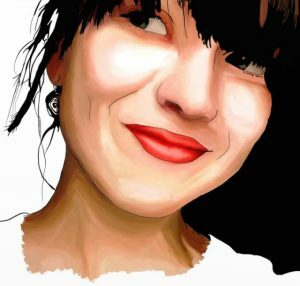 Guides and Tutorials, and User Contributed Articles. ^ Alex Hern. Spam email operator's faulty backup leaks 1.37bn addresses. The Guardian. Latest US News, World News, Sports, Business, Opinion, Analysis and Reviews. This entry was posted on 2017-03-08 at 03:50 and is filed under Adware, Viruses. You can quickly scan the QR code with your mobile device and have DragonBoost ads manual removal instructions right in your pocket. How did you remove DragonBoost ads?